“The power float cut the inside of my horse’s mouth and there was blood everywhere!”. “My horse wouldn’t eat for days after power floating!”. “Power floats remove too much and kill the teeth!”. “Power floats cause heat damage and kill the teeth!”. Power floating myths are among the most resilient stories in horse industry folklore. It is a constant battle to deal with misinformation and fear mongering that some people put out there. A little bit of education goes a long way toward increasing people’s comfort level when it comes to power dentistry. I would like to show people that in the hands of a trained professional motorized equipment does a great job, is efficient and safe. MYTH: So picture the following real life scenario. I’m working on a young horse and I start by pulling out the wolf teeth. There is obviously blood associated with the procedure. Add to that 1-4 cap removals (more blood) and things can get quite messy. I move on and start power floating a mouth that is now dripping blood from multiple extraction sites. Blood pools in the lower lip and spills randomly down my arm, the bloody tongue is flicking drops of blood every which way. After regularly reaching into the mouth with my gloved hand to check my work I grasp the float with my now bloody gloves and happily work away. You should now have a mental image of me with my blood spattered face and clothing, bloody hands and bloody tools. It’s a scene right out of an episode of Dexter. And this is the moment that some unsuspecting horse owner walks in and gets their first impression of power dentistry! Years of client education are slipping away from me as I scramble to explain the work that took place before they walked into the barn. Truth: The reality is that power floating is generally a bloodless procedure. The carbide or diamond grinding wheel works very well on enamel but is essentially harmless to the cheeks and gums. I can even hold my thumb over the spinning wheel and to this day I still have fingerprints! Guess I have to put off my life of crime a little while longer! Trauma is also reduced due to the precise action of the power float. I can place the tool exactly where I want it to work as opposed to the long stroking action required with hand floats. Myth: I once had a barn tell me that they refused to have their horses power floated. Their reason was that they had tried it once before and the whole barn stopped eating hay for days! Then they told me they had started a new batch of hay the same day…and that the horses that didn’t even have their teeth done were not eating it either. Truth: A floated horse should be ready and willing to eat as soon as they wake up from the sedation (sometimes sooner!). Horses requiring major corrections or those that have TMJ pain may need a little Bute on the day of the procedure if they are sore from wearing the speculum. If anything power floating is better for these guys since it is faster and they spend less time with their mouth open. There probably have been cases where the grinding surface was excessively floated or the incisors were reduced too much causing the horses to be unable to eat properly. These cases are rare and easily avoidable with minimal training on the equipment and procedure. Myth: People are terrified that power floats will bolt out of control and grind off an entire tooth in the blink of an eye. The tooth will die and a multitude of terrible consequences will ensue. Truth: I know I said power floating is efficient but let’s not get carried away! It does take some effort to remove the desired amount of tooth. When there is a lot of tooth to remove (as in large hooks, steps etc.) it may have to be done in stages. A few millimeters today, then a few more in 3-4 months until the tooth is returned to normal. Taking off too much doesn’t happen easily, you have to work at it. An understanding of the anatomy of the tooth and the simple rules of floating greatly reduce the risk of over floating and any ill effects that could result. Myth: Another comment I hear all the time is that the high speed spinning grinding wheel generates a lot of heat that will damage the tooth. Over time that damage will lead to tooth death and loss. Truth: There is actually truth to this theory. It can indeed happen. This is another case of a problem that is avoided with a little knowledge and training. There is a limit to the amount of time spent grinding an individual tooth. It is important to respect that time limit when working on a single tooth especially if the tooth needs significant reduction. If necessary, water can be used to cool the tooth. 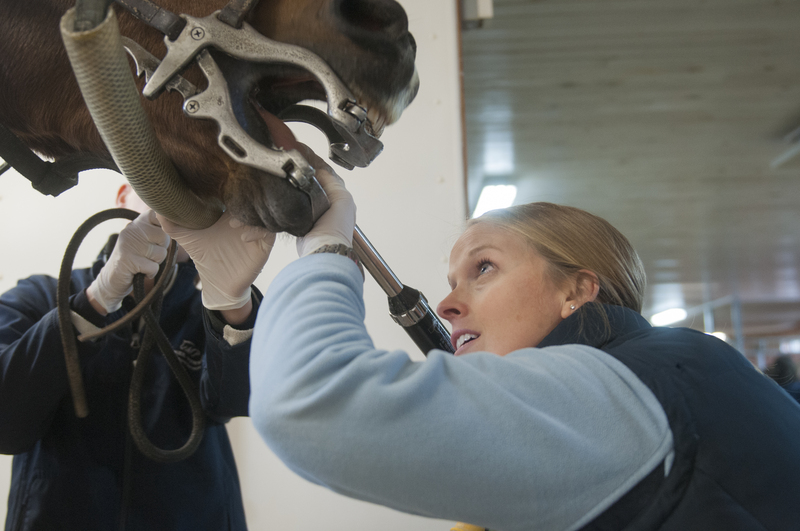 The introduction of motorized equipment has greatly changed the face of equine dentistry. The horses receive better care and spend less time in the speculum, and the veterinarian does not suffer from fatigue and the sloppy results that occur with hand floating. I hope that by educating my clients on the advantages of power floating the day will come when fear of the power float is a distant memory. This entry was posted in Equine Dentistry and tagged dentistry, equine, powerfloat, speculum. Bookmark the permalink.